Early Victorian (1837 to 1852) British Cavalry Officer's Mameluke Sabre (sword). Exceptionally fine example of a particularly rare and much sought after 1800's British Cavalry Officer's Mameluke sabre (sword), made even more special by the fact it was made by the most prestigious cutler of the time "(Thomas) Hawkes and (John) Moseley & CO London manufacturers to the Queen (Victoria)". 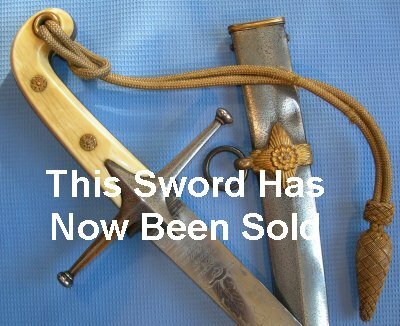 Very finely etched with the detail still in remarkably good condition for the age, plus an ivory grip which, while cracked as ivory will always do, is all there, complete with original sword knot and still fine (though pitted) scabbard, this is indeed a cut above most mamalukes. The 30 1/4 inch (76.8 cm) hatchet point blade is firm in the hilt and grip firm also. Given the scarcity of cavalry officer mamelukes and the well above average condition of this example. Further pictures available upon request. Sword reference number 133.